With a mission to spur development of low-carbon societies and enhance climate resilience across developing and middle-income countries worldwide, the $8 billion Climate Investment Funds (CIF) held its Stakeholder Day and 2014 Partnership Forum in Montego Bay, Jamaica the week of June 22. With CIF membership expanding to encompass 63 countries, the event, co-hosted by the Inter-American Development Bank (IADB), brought together some 500 attendees engaged in climate finance activities to network and share the knowledge they have gained carrying out CIF activities since its founding in 2008. Stepping up efforts to foster deployment of and increase access to renewable energy generation capacity, 14 countries from Africa, Asia, Latin America and the Caribbean were invited to participate in the Scaling UP Renewable Energy in Low Income Countries Program (SREP). Libya was invited to join CIF’s Clean Technology Fund. A five-year retrospective report of CIF’s activities in 48 pilot countries was presented during the conference. Entitled, “Learning by Doing: The CIF’s Contribution to Climate Finance,” the report paves the way to more effective and widespread climate finance by sharing the lessons learned, successes and challenges faced in making the transformation to low-carbon societies. Fourteen countries have contributed $8 billion to CIF, the UN’s principal multi-lateral climate finance vehicle. The World Bank Group’s International Bank for Reconstruction and Development (IBRD) serves as CIF’s trustee. Expectations are that other sources, private sector organizations in particular, will provide an additional $55 billion. 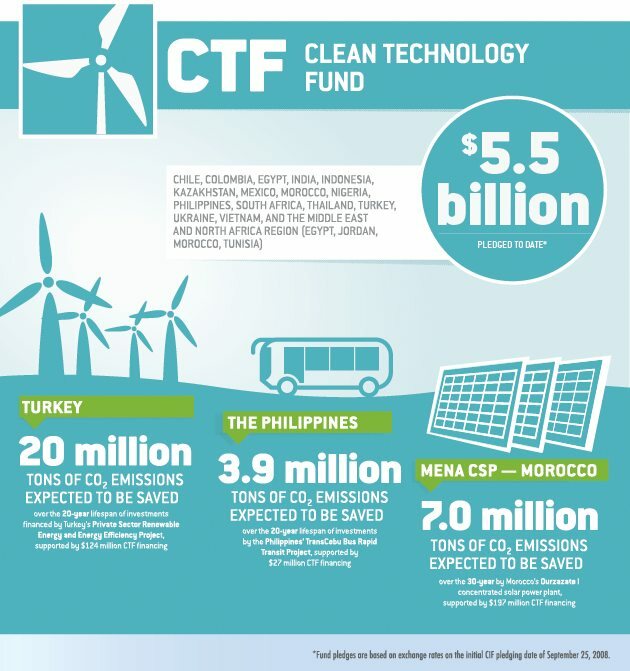 The Clean Technology Fund (CTF) provides middle income countries with highly concessional resources to explore options to scale up the demonstration, deployment, and transfer of low carbon technologies in renewable energy, energy efficiency, and sustainable transport. The $551 million Scaling Up Renewable Energy in Low Income Countries Program (SREP) stimulates energy access and economic growth by working with governments to build renewable energy markets, attract private investment, and target renewable energy technologies that allow for the generation and productive use of energy in households, businesses, and community services. Learning by doing to achieve results: A new and growing field, CIF serves as a testing and proving ground for climate finance and investment, with results reported and measured annually and distributed widely. 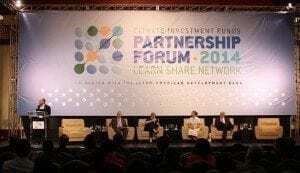 Armenia and the Solomon Islands presented their SREP investment plans during the Montego Bay conference. The CIF board endorsed Armenia’s $40 million and the Solomon Islands’ $14 million plans. Armenia intends to use CIF funds to spur investments in geothermal and utility-scale solar, as well as to support national efforts to meet 21 percent of its electricity needs from renewable sources by 2020. At present, Armenia relies on imported fuels for 70 percent of its electricity generation. The Solomon Islands is looking to use CIF funds to dramatically increase electricity access in an ecologically, as well as economically, sustainable manner. “Currently 90 percent of energy access is in the capital,” the Solomon Islands representatives noted, “yet 80 percent of the population lives in rural areas on hundreds of islands.” The Solomon Islands government intends to deploy renewable energy mini-grids across 60 rural communities, as well as build grid interconnections and connect to home solar energy systems.